"Killjoys," a space- based show on the Syfy network, has been renewed for a second season in 2016. The space-based action shows "Killjoys" and "Dark Matter" will both be getting second seasons in 2016, the Syfy network announced this week. "Dark Matter" tells the story of six people who wake up on a spaceship with no memory of who they are, or how they got there. According to a statement from the network, the show averaged 1.8 million viewers in its first season. The second season will consist of 13 episodes, and will premiere sometime in 2016. The first season ended with a shocking revelation and a major cliffhanger, leaving fans eager for a second season. The show's cast includes Melissa O'Neil, Marc Bendavid, Anthony Lemke, Alex Mallari Jr. and Jodelle Ferland, with Roger Cross and Zoie Palmer. Created by screenwriter Michelle Lovretta (who talked with Space.com before the show's premiere), "Killjoys" is packed with lots of treats for science fiction fans, including gorgeous cosmic scenery and talking spaceships. 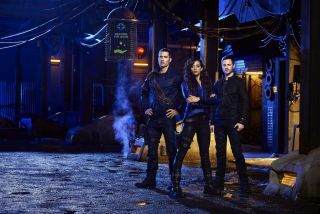 There's also great chemistry among the show's three main cast members — Hannah John-Kamen as Dutch, Luke Macfarlane as D'avin and Aaron Ashmore as John. "With exciting space-based action, deep world building and a standout cast, 'Killjoys' has struck a nerve with viewers and critics alike," Bill McGoldrick, executive vice president of original content at Syfy, said in a statement. "We can't wait to see what adventures Michelle Lovretta and Temple Street take Dutch, John and D'avin on in season two." The Syfy channel has a strong space lineup set for late 2015 and 2016. In December, the network will debut a 10-part series called "The Expanse," based on the book series of the same name by James S. A. Corey (the pen name for Daniel Abraham and Ty Franck). The network has also announced plans to develop shows based on Frederik Pohl's book "Gateway," and Dan Simmons' novel "Hyperion." In addition, the network's time-travel-themed show "12 Monkeys," which is inspired by the 1995 Terry Gilliam movie, has also been renewed for a second season.